When was the last time you ate breakfast for under $2 in Eastown. You can't even get a cup of coffee at Kava House for under two bucks. 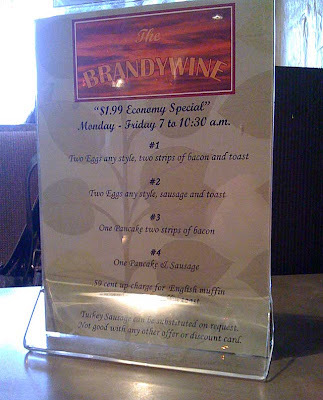 But with the Brandywine's economy special, two eggs, bacon and toast is just going to cost you a little more than a gallon of gas. Despite the great deal before me, I order the Brandywine eggs Benedict. The meal made me forget all about the stock market and the sideways snow, both of which fell outside. It also reminded me of something I thought about after reading Josh's post about Las Vegas. When a few of us descend on said city in a few weeks, we might be confronted with a unique opportunity - experiencing Sin City at half capacity. I can only imagine the great photo opportunities we might encounter. Looking forward to it! Let's capture the crap economy as we see it. I've noticed a lot of renewed interest in the photography of Dorothea Lange who used a camera with film in it to capture iconic images of the Great Depression. She was pretty good at taking pictures, but we've got Nikon dSLRs and Photoshop and iPhones. And will someone take Ken Rockwell up on his "New Ghost Town Photo Opportunity" while in Vegas.